Since the beginning of the year, the Turkish lira has plunged some 40 percent against the U.S. dollar. Much of the nosedive occurred last week, after Washington announced higher tariffs for steel and aluminum from Turkey. The Turkish authorities have put an evangelical American pastor, Andrew Brunson, on trial for alleged involvement with terrorist groups, as the Kurdistan Workers’ Party (PKK) is officially and internationally classified. The United States has asked him to be freed; Turkey, while relaxing Mr. Brunson’s two-year prison detention to house arrest, has said its judicial process is independent and must run its course. In retaliation, Washington imposed tariffs and put sanctions on two Turkish cabinet ministers. We can now read and hear a cocktail of opinions about the lira crash, ranging from blaming the U.S. and especially President Donald Trump’s administration (the usual scapegoats) to castigating the domestic and foreign policies of President Recep Tayyip Erdogan(another favorite culprit). Although these political actors and their administrations can trigger momentary movements (and in this case, their basically unrelated actions accelerated the currency’s weakening), the underlying causes of the market turmoil run much deeper. Since Mr. Erdogan’s Justice and Development Party (AKP) took power in 2002, the Turkish economy has grown at a breakneck pace. However, as Turkey’s low savings rate did not provide sufficient capital, economic growth was largely financed in foreign currencies, especially in U.S. dollars and euros. This made Turkey’s rapid expansion dependent on foreign investment and capital inflows, and drastically increased business liabilities in foreign currencies. Since the country needs to import almost all of its energy along with most intermediate goods for exporters, it also runs a structural foreign trade deficit, worsening its payments balance. With the U.S. Federal Reserve and the European Central Bank following policies of low or negative interest rates, Turkey – which offered higher yields and fast economic growth – was confronted with an excessive inflow of foreign capital. This kept the lira exchange rate strong. When the Fed started “tapering” – in other words, phasing out quantitative easing and reintroducing higher interest rates – investors responded by cutting their exposure to emerging markets. Countries such as Brazil, Indonesia and Turkey were left without enough capital to keep financing growth. In the meantime, following the example of the U.S. and many European Union governments, Turkey tried to further stimulate the economy with strong public expenditures and interest rates that were perhaps lower than necessary. These policies have now resulted in downward pressure on the lira. 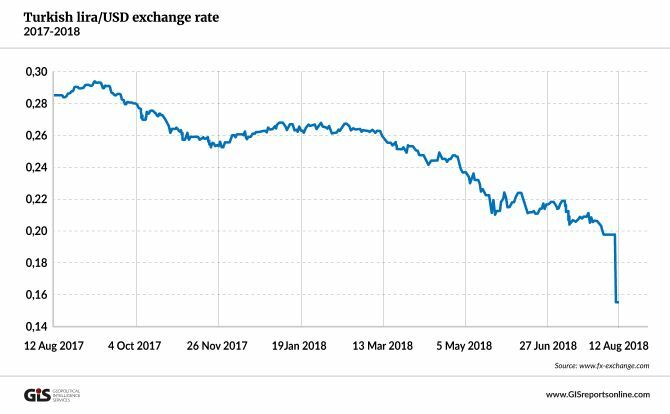 Given the export orientation of Turkey’s economy, there were good reasons for monetary policymakers to be wary about increasing interest rates, which could have resulted in a strongly overvalued lira. However, once the currency began to weaken, the large foreign debt of Turkish businesses became a very serious problem. The Turkish economy is now caught in a vicious circle, partly due to its structural imbalances, but also to the unintended consequences of global monetary policies. The lira is becoming drastically oversold, just as it was probably overvalued in the recent past. This is the same trap that other smaller currencies have fallen into, because they are exposed through trade and investments to the extreme policies in the large currency areas – the U.S. dollar and the euro. Washington cannot be blamed for these problems. However, taking advantage of Turkey’s financial difficulties to secure political gains (freeing Mr. Brunson, blocking procurement of Russian arms, influencing Ankara’s policies in Syria) will only worsen the lira’s downward spiral. In the long term, it might prove shortsighted. Experience shows that political bargains are more likely to be struck through quiet diplomacy, applying leverage behind the scenes, rather than by twisting arms in public. That only makes the negotiating partner lose face. Europe would also be well advised to look for ways to help Ankara instead of indulging in schadenfreude. Turkey is an important partner in politics and trade. Berlin, at least, appears to have recognized this and will be receiving Mr. Erdogan for a visit in late August. One hopes the discussions will be constructive. What Turkey needs now are friends. Bashing the country, or using the crisis to back it into a corner to achieve other objectives, can only backfire and make the monetary crisis worse. All it would accomplish would be to push a longtime ally in the wrong direction. It certainly will not help Ankara make the right decisions.